Heat oven to 350°F. Grease bottom only of 9x5-inch loaf pan. In large bowl, mix flour, sugar, baking powder, salt and allspice with spoon. Beat in buttermilk, butter and eggs until blended. Stir in blueberries and pecans. Spread batter in pan. Bake 1 hour 15 minutes to 1 hour 20 minutes or until toothpick inserted in center comes out clean. Cool in pan on wire rack 10 minutes. Run knife around edges of pan to loosen loaf. Remove loaf from pan; place on wire rack. Cool completely, about 1 hour 30 minutes. In small microwavable bowl, microwave vanilla baking chips on High 30 seconds. Stir until melted; if necessary, microwave in additional 10-second increments until melted. Beat in powdered sugar and enough milk until smooth and desired drizzling consistency. Drizzle icing over loaf. Let stand until icing is set before storing. *To substitute for buttermilk, use 1 tablespoon vinegar or lemon juice plus milk to make 1 cup. 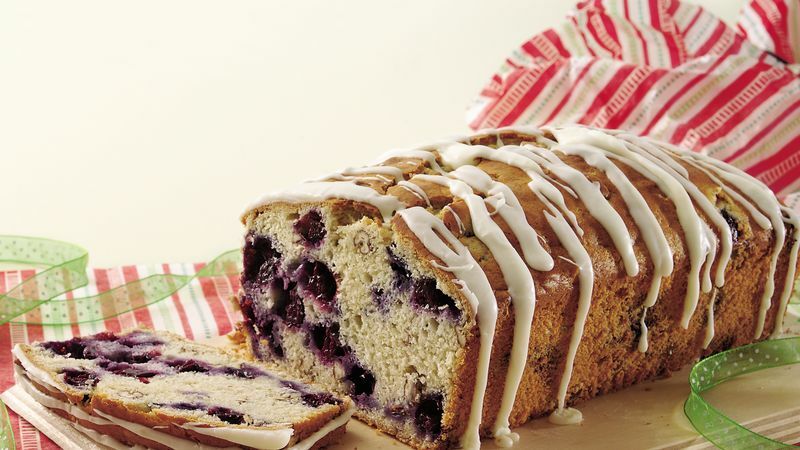 This delicious loaf makes a great gift. Place toothpicks into the top surface of the loaf to protect the icing from sticking. Then wrap the loaf in colored cellophane and tie with a pretty bow.